The character of Lady Met was first introduced on banners, leaflets & flyers as a cartoon figure in the mid sixties. 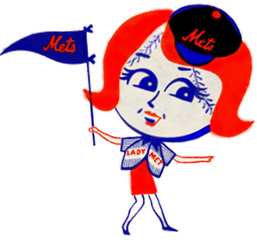 She also donned pennants, buttons, Mets rain check tickets & had her own rag doll for the little girl Metsie fans. She was then pictured with the original Mr. Met back in the sixties. 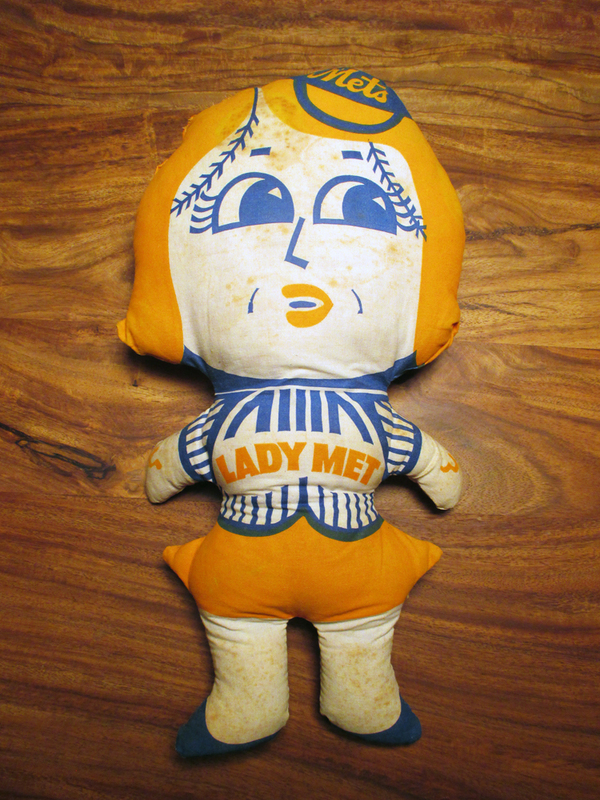 Soon, Lady Met started making appearances, showing up with Mr. Met around Shea Stadium. Her appearance was similar to Mr. Met, a large baseball head, with big eyes, but Lady Met had long eye lashes, long red hair and a more shapely figure. Lady Met sported an orange flip shoulder length hair style, with matching orange lipstick & a mod mini skirt. She also wore a little sweater with her name "Lady Met" across her chest. 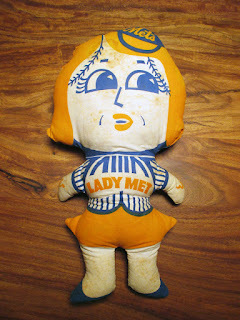 The chick was cool, she was not yet known as Mrs. Met & as she had her own identity. During her time on the field mostly before games in the early seventies, she had a "plaster of Paris" made head, like Mr. Met. In the seventies she finally tied the knot & became Mrs. Met. The two would be seen together at Shea Stadium, before games & at the 7th inning stretch. By the time the eighties rolled around, both she & Mr. Met had disappeared from the organization. 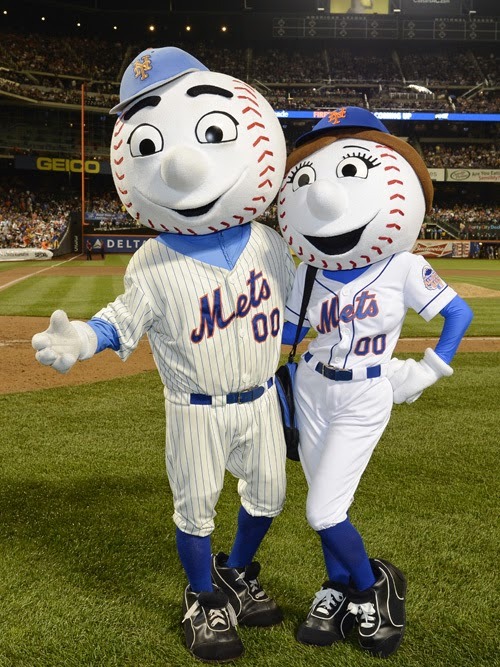 In the mid nineties Mr. Met came back but it took a few more years for Lady Met or Mrs. Met to make her return. In 2003 Mrs. Met returned, as she & Mr. Met with three little Mets children, appeared on an ESPN Sports Center commercial in 2003. In 2005, centerfieldmaz photographed the Mets family riding in a red convertible, at a Mets game in Shea Stadium. Strangely, that day Lady Met was not wearing her orange hair, was this Lady Met, Mrs. Met or another female character? 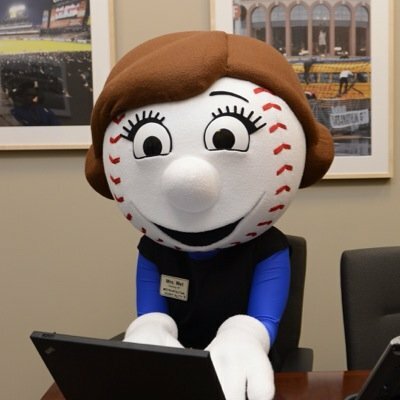 Finally In 2013, just in time for the All Star Game at Citi Field, the Mets officially announced the return of Mrs. Met. The club made a statement saying that she had been working as an event planner & was returning to work full time, now that the kids are grown. Her name is actually Jan.
Mrs. Met greeted fans around New York at the All Star Game events in her return. She now has a new hair style, sporting a brown pony tail under a Mets cap. She wears high sox with black sneakers & a white Mets home uniform. 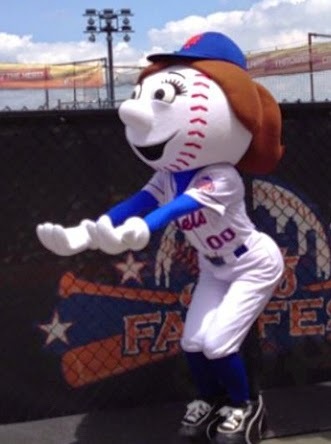 In addition to her on-field appearances, Mrs. Met also shows up for Mets non-game-day events. Of course she has a website & her own Twitter account. She is one of baseball's oldest mascots & a ground breaking pioneeress, being the sports first female mascot as well! !